One of the things to remember when looking for a desk to use in a reception area is that this isn’t a regular office desk. It’s the first desk your customers and clients see when they walk in the door so it’s important that it makes a good impression. Because there are so many options out there, we researched some of the best-sellers and most popular brands to put together this buying guide. First, let’s look at some key features. Finish: While most of these desks are made of laminate or melamine, they are available in a range of colors and styles. You’ll find various wood finishes as well as more neutral colors like black and white. Shape: There are a few different shapes that show up in our list. Some are simply rectangular while others are more rounded. If you want something with more space, we found some great L-shaped options as well. Drawers/Shelves: Storage in these desks varies quite a bit. Some of these pieces don’t have much at all while others have multiple shelves, additional file cabinets, or locking drawers. What you need depends on the kind of work this desk will support. Pieces: Most of these are one piece. Yes, these desks might have four different pieces connected together to make one large desk, but it’s still one large desk. There is one product we found that has a separate file cabinet, though. Size: Obviously, size is important because this desk will need to fit in a certain space in your place of business. Make sure you have enough room that both your receptionist and customers have enough room to move around. Warranty: Warranties vary a bit for these products but, for the most part, they’re pretty good! There are a few that are covered for upwards of 10 years and even a handful that come with a lifetime guarantee! Now that you know a little more about what to look for, let’s take a look at our reception desk review. Here’s the deal. If you’re in a hurry, don’t worry. We put our top and budget picks right at the top of the list so you can see the range of products available. Stick around if you can, all of these items are different and you never know which one is right for you! Ready to get started? Let’s go! When it comes to best reception desks for sale, the Mayline Sterling Reception Station is our top pick. The simple, contemporary design is a nice, compact size that can work just about anywhere. 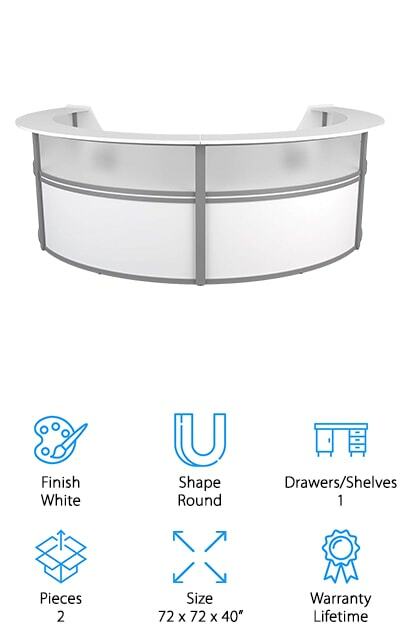 The top of the desk features a ½-inch thick frosted glass counter that your customers will love. This desk is made of laminate and is available in two different colors: a beautiful light brown driftwood color and dark mocha. That’s not all, if you want a larger version, there’s also a 96-inch option available that also comes in a warmer brown sugar hue. This desk is beautiful, functional, and will look good in any reception area. It’s simple, sleek design is a welcoming without being overwhelming and provides a completely professional look. Plus, it includes a lifetime guarantee. If you’re looking for a cheap reception desk that still looks professional, check out our budget pick, the Alera Valencia Reception Desk. It’s composed of commercial-grade laminate that’s extremely durable. In fact, it’s water, scratch, and stain resistant. There’s also a banded edge for additional protection against bumps and dings. 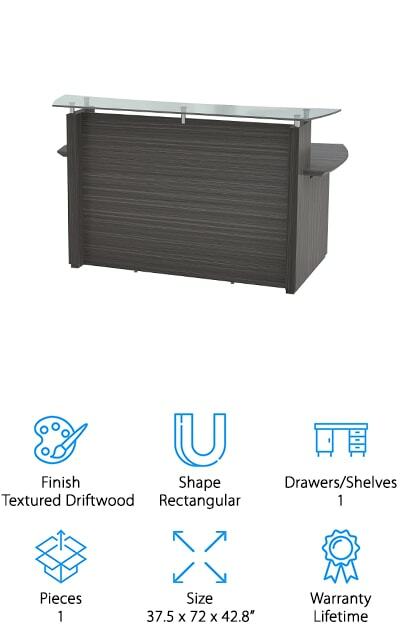 The transaction counter is an ideal height for customers or guests plus there are high-sided panels to give your receptionist a little more privacy. That’s not all, it also has two grommets for easy cable and wire management so any computer equipment and cords can be kept need and tidy. One more thing, something that we really liked about this desk are the leveling guides that help compensate for uneven floors. This makes for a more professional look. 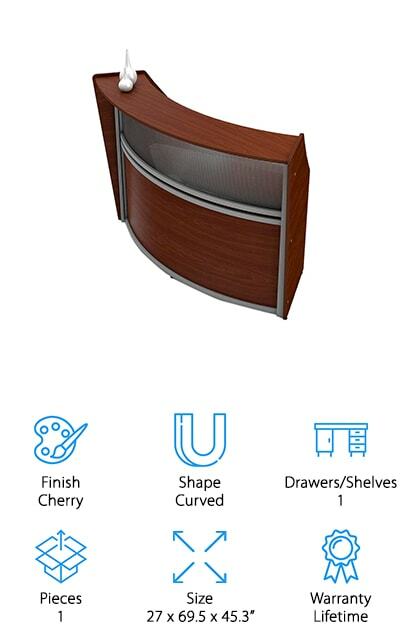 The RCS Dallas Reception Desk is one of the most beautiful products we found in our research. It has a distinctly rustic, industrial look that’s very different from what we’ve seen so far. The frame is made of steel and it features pine boards along the front and side. The natural color of the wood pops against the black trim and customer counter, creating a gorgeous contrast that really pops. There’s a large L-shaped desk on the opposite side with more than enough room for a computer, phone, and everything else a receptionist needs to work effectively. There’s even a hole to feed cables and cords through to keep the work surface neat and tidy. Plus, this desk doesn’t blend in. Your customers will know exactly where to go when they walk in the door. Next up is this great receptionist desk from OFM, the Marque. This design is really modern looking. It’s rounded in shape and features a powder coated silver steel frame. The bottom front and top shelf are made of thermo-fused melamine. There’s also a frosted pane below the top shelf that allows light to pass through while still providing privacy for the person working behind the desk. The interior desk is just shy of 20 inches deep and has enough space to hold all the necessities. There’s even a hole that helps with cable management and clutter. 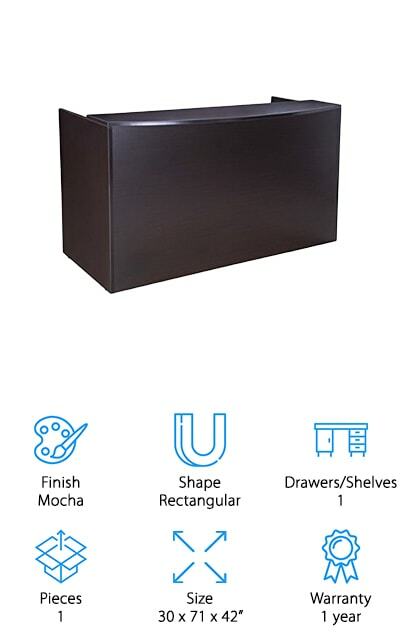 A modular file cabinet with two locking drawers is also included. Assembly is really easy, there are no additional tools needed. Plus, it even comes with leveling guides that protect your floors while making sure you have the best workstation possible. OfisLite’s reception desk is one of the larger options we found. 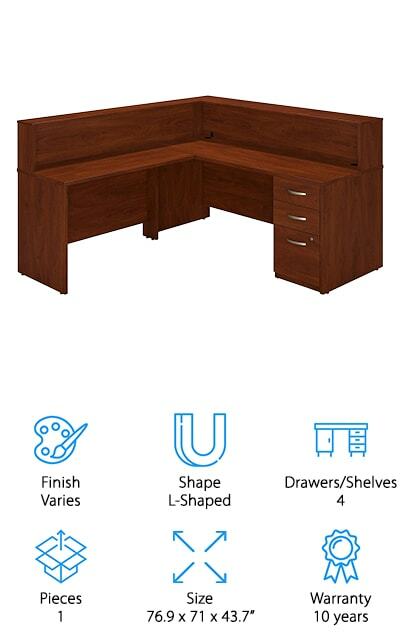 This is a larger workstation that’s perfect if your business requires two receptionists or if your receptionist is responsible for more than welcoming guests and needs more space to work effectively. This unit consists of two desks and two hutches arranged in an L-shape. Its commercial grade construction features melamine laminate that has finished edges that are able to handle high impacts without damage. The deep espresso color is perfect for the lobby or in an office and the contemporary design has clean, simple lines that suit any decor. One of the desks features a pre-cut hole for cable organization. That’s not all, each hutch features shelving that will really help keep everything organized and clutter-free. Assembly is straightforward and simple and requires only basic tools. The right office furniture is important because it’s one of the things that makes the biggest impression on guests to your business. That’s one reason why we picked the Line Italia Reception desk for the next spot on our list. This desk is professional looking but has a lot more fine details than a lot of the ones we’ve seen so far. It’s made of wood and polycarbonate and features smooth cherry wood laminate surfaces. The front bottom portion of the desk features a silver frame and accents that stand out nicely against the warm tones in the wood. There’s also a privacy window below the top shelf that adds some brightness to it. Light comes through while still providing privacy for the receptionist. Plus, they’ll have more than enough space to organize. The Bush Business Reception Desk is perfect if you’re looking for an office reception desk that’s a little more traditional looking. This is a large desk that’s perfect for a shared workspace. 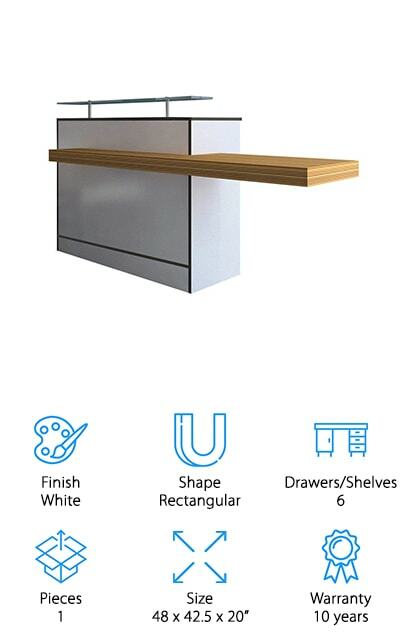 It includes a main desk, L-extension, shelf, and even has a 3-drawer pedestal. There’s more, the L-extension can be placed on either side of the desk to better fit your space. The laminate is commercial grade, thermally fused for strength and resistance to scratches and stains. As for the drawers, there are two large box drawers and one that is set up to hang files that even comes with a lock for security and privacy. They’re designed with full-extension ball-bearing slides that provide easy access to all of the contents inside. One more thing, this one comes with a 10-year warranty. Another great reception desk for sale that provides a lot of storage space is the Regency Seating Reception Desk. This desk has a larger, L-shaped work area that provides more than enough desktop space for everything your receptionist needs to welcome guests to your business. It’s made of fused melamine laminate with a cherry wood finish and has a more traditional look. The edges are finished in 3mm PVC that matches the rest of the desk perfectly and protects against the wear and tear of an office lobby. This desk also features two hanging pedestals, each containing a box drawer and a full extension file drawer. East set of drawers locks so that all documents are kept secure. One more thing, this desk comes with a lifetime guarantee. 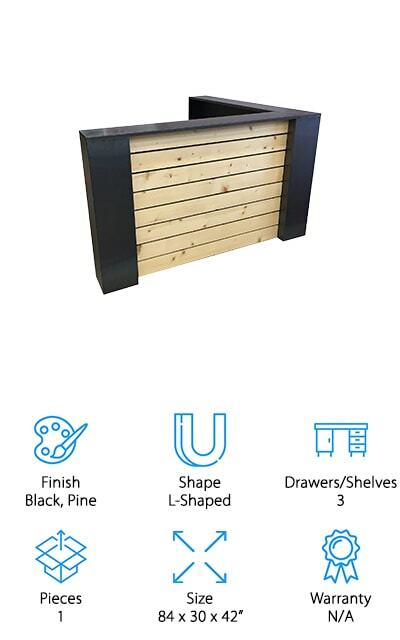 The Onix Reception Desk is perfect for a welcome desk, security counter, or hostess stand. What’s different about this product is that it’s a standing desk. The workspace itself is quite small but can fit a telephone and a laptop computer. The surface includes grommet holes for easy cable organization. There is also a lot of shelving space, more than we’ve seen so far. There are six shelves on the inside of the unit as well as one large wood-toned shelf that extends out to the side. 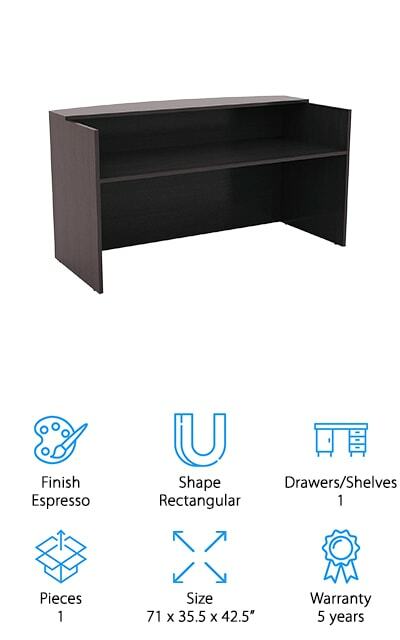 This shelf can be used as additional workspace or designated for customers or guests. It’s made of white high pressure laminate that’s durable and easy to clean and includes plastic sliders to protect your floors from damage. Plus, assembly is easy. All you need is a Phillips screwdriver. 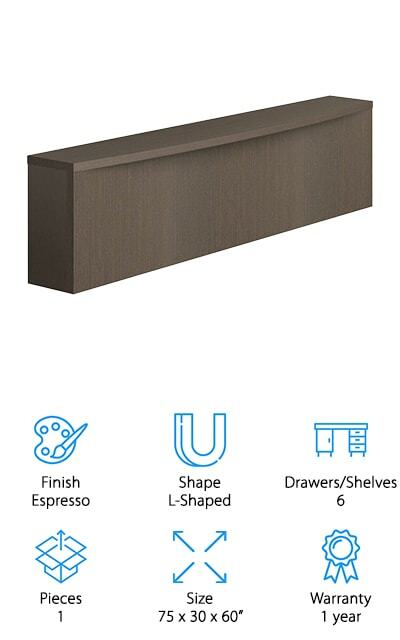 Our last pick for a reception area desk is this modern design from BOSS. This is a pretty sleek and simple design. The rectangular shape has a curved top ledge where the customer or guest stands while greeting them. The inside work surface is a really nice size, there’s more than enough room for a computer, phone, files, and more. To help keep the workstation neat, there’s also a grommet in the back right corner of the desktop for cable management. The high pressure laminate construction is strong and resistant to scratches plus there’s 3mm PVC edging for extra protection against dings and other damage. That’s not all. Assembly is really easy. It uses cam-locks for a fast and accurate build. All you have to do is grab a screwdriver and you’ll have it together in minutes.